The University of Chicago Urban Labs and CSH (Corporation for Supportive Housing) released a study today on family homelessness: Ending Family Homelessness Report: Understanding the scale and needs of families experiencing homelessness in Chicago. This report, for the first time, combines deduplicated data from the Chicago Homeless Services System and the Chicago Public Schools. Chicago Coalition for the Homeless served on an advisory committee to the research project. In the past year, approximately 10,000 families experienced homelessness in Chicago. Four out of five of these families (just under 8,000) were living doubled-up with friends or relatives. Only 13% of families experiencing homelessness in Chicago access services from the Continuum of Care. Families accessing the shelter system overwhelmingly have income below the Federal Poverty Level. (Almost one in three self-report no income at the time of accessing services.) The majority are single-adult households headed by a female. Four out of 10 families in shelter self-report a disability, and one in five self-report a mental health problem. Living doubled-up is the most common pathway to entering the shelter system. The majority of families (55.5%) who access shelter have previously experienced homelessness while living temporarily with others. Fifty percent of families that contact the service system while at-risk of homelessness later entered shelter. Of those, half enter shelter within three months. The reports predicts the housing needs of families that have entered the shelter system and been assessed, but those living doubled-up are not receiving assessments. The reason they have not been assessed is because the majority of the city’s current housing resources are federally funded by HUD. Families that are doubled-up do not meet HUD’s definition and therefore are ineligible for HUD’s housing resources. 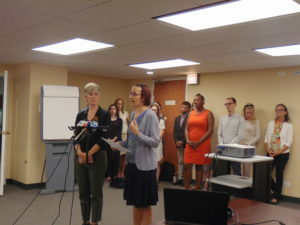 Advocates are making a number of recommendations at the city and state level to address the need to better understand and assist doubled-up families as well as to address other findings from the report. The groups supporting these recommendations are: CSH, Chicago Coalition for the Homeless, the HomeWorks campaign, Catholic Charities, Ounce of Prevention Fund, Heartland Alliance, and All Chicago. On the city level, we recommend that we start to assess all doubled-up homeless families that present at school or daycare sites and connect them to resources to address their homelessness. Currently, those resources are very limited, so we also recommend that we begin to identify flexible local funding for housing and services that do not carry HUD’s restrictions. This would ensure that families who are doubled-up are defined as eligible by our service system for these new resources. The report found that 31% percent of sheltered families had no income, 27% rely on benefits only, and 27% had income from employment. Because of those findings, we recommend that the city increase the enrollment of homeless families in community-based child care slots to 5% of all those enrolled, with an annual evaluation of how they are meeting this goal. Also, at the state level, we recommend that children from homeless families be presumed eligible for child care, with all family co-pays waived. We also recommend the state increase its TANF cash assistance grant to 50% of the federal poverty line, which for a family of three would increase from $520 a month to $864 a month. Finally, were concerned about the finding that nearly half of all families that enter the shelter system sought support services but were not prevented from becoming homeless. These families could have been prevented from entering the system, but funding for homelessness prevention has been cut drastically in recent years. In addition, the study found that many of the families were ineligible for reasons such as needing to prove ability to pay all future rent. Because of this, we want to increase funding for homelessness prevention grants, which provide emergency cash grants to families to keep them in their housing. At the state level, we want to increase funding from $4.9 million to $6.9 million. We also recommend that the city commit $2 million of its own resources for prevention. We also recommend that the eligibility criteria for prevention be expanded so that more families that apply for help can be assisted. The Urban Labs/CSH study was supported by the Polk Bros. Foundation, Chicago Community Trust, and Pierce Family Foundation.